DISCOVER TAJIMA >Hot Springs	>Shichi Kama Onsen "Yuraku Kan"
Shichi Kama Onsen "Yuraku Kan"
Shichi Kama Onsen is a unique hot spring in Hyogo Prefecture. It is the prefecture’s only government designated People’s Recreation Spa. (There are a total of 91 such places in the nation.) 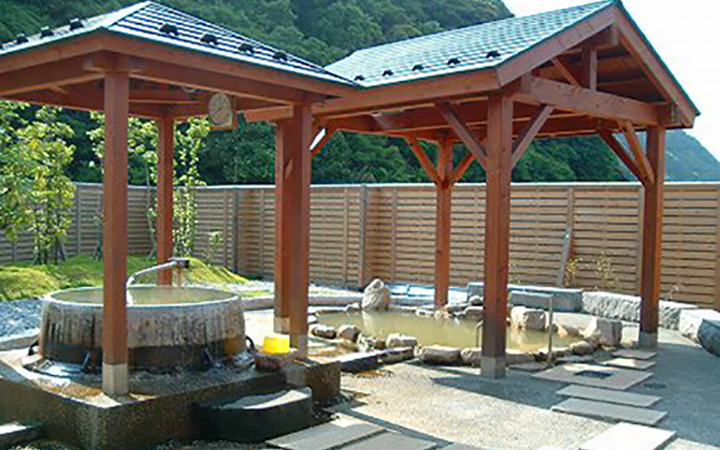 The hot spring is ideal for recuperation, recreation, and relaxing. A pleasant breeze and woodsy aroma envelope this hot spring located in a calm rural area. You’ll find the open-air outdoor bath surrounded by rich nature. Enjoy the constant flow of 100% natural hot spring water. Takeno Onsen Kitamae Building "Tanjyo no Yu"
Izushi Onsen Building "Otome no Yu"